Deep in the darkest recesses of Ottawa sits Stephen Harper, plotting his majority government and all the wonderful things he will do if he ever gets one. But I have news for you Mr. Harper. I have analysed the last 3 majority government leaders and have noticed one similarity between the 3 of them. You see Mr. Harper they are all easy to cartoon because they already look like caricatures. 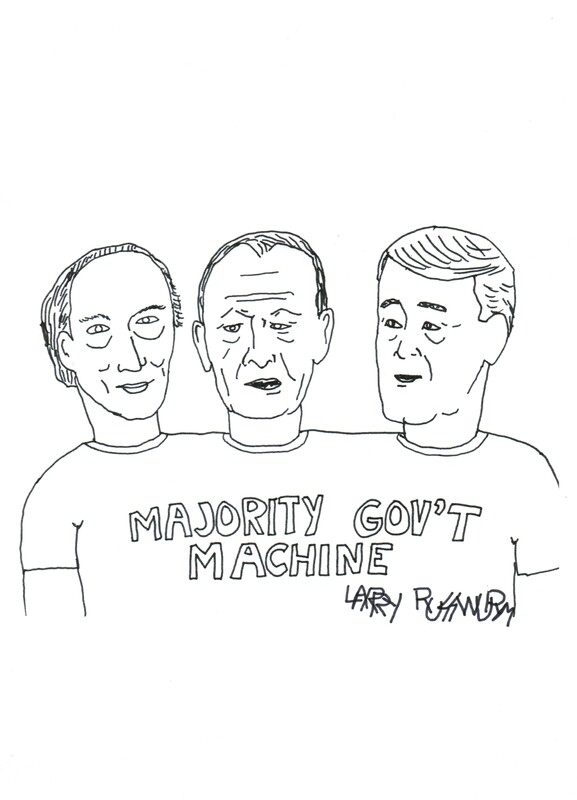 Below is my drawing of the three connected as they are by majority governments. The head on the left is Trudeau who led for many years, in the middle is Chretien who had majorities for 3 terms and furthest right is Brian Mulroney who had two majorities. Or as I like to call them, What-the-bleep-is-that?, Twoface, and Chinosaurus. Successful politicians all and they are all easy to draw. Or for the public to easily recognize. So ask yourself, Stephen Harper if you look like a caricature. Hint: I can make political cartoons but you I find problematic sometimes. These guys were a breeze to draw. That’s right Stephen Harper, I predict only minority governments for you in the future. All thanks to my superscientific, new way to identify majority government prime ministers. You know Ignatieff does have those wicked eyebrows. I bet he’d be easy to cartoon. This entry was posted in Cartoon, Humour, Politics, Pseudo Science and tagged Brian Mulroney, Canada, human caricatures, Jean Chretien, Pierre Trudeau, political cartoons, Stephen harper, the last 3 majority governments of Canada. Bookmark the permalink. However a notable difference between past conservative governments and Stephen Harper s current incarnation is that past conservative governments were formed by coalitions between blue and red Tories among other stakeholders. For the average Canadian Harper s Conservatives are just too blue to form a majority.